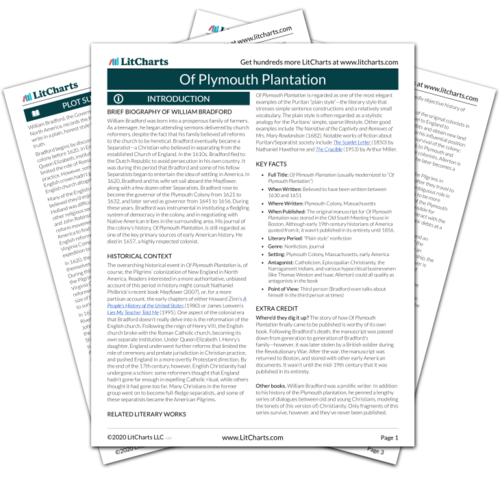 Instant downloads of all 942 LitChart PDFs (including Of Plymouth Plantation). 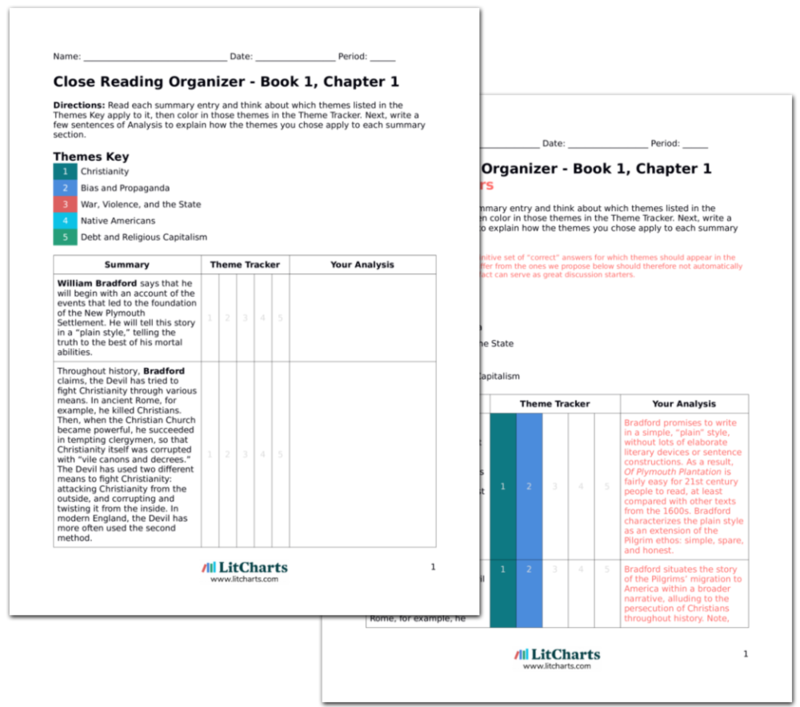 LitCharts assigns a color and icon to each theme in Of Plymouth Plantation, which you can use to track the themes throughout the work. In 1643, on April 18th, William Brewster dies after a long illness. Bradford wonders if Brewster’s life was made worse by his “former sufferings,” but concludes that these pains and illnesses made his life richer by adding to his honor. Bradford says he will now write something of Brewster’s remarkable life. As the book nears an end, its tone becomes more retrospective and wistful—never more so than in Chapter 23, when Bradford writes about Brewster’s long, happy life. Brewster was educated at Cambridge University, where he studied religion, as well as Latin and Greek. He was then appointed an ambassador to Holland, where he won many friends. When he retired to live in the country, he did much good in his community by promoting religious values. He also began to campaign against the corrupt prelates and bishops of England, eventually leading a widespread English reform movement. William Brewster was one of the key leaders for the English Separatist movement: he used his expert theological training to lead the North English people in his own unique interpretation of Protestantism, attacking the corruption and needless complexity of the English prelate system. Brewster was instrumental in leading the Christian reformers into Holland, and was their leader for more than a decade. During this period, he was regarded by both the Dutch and his English followers as a great public speaker and teacher; he was also praised for his abstinence, faith, and tenderness. Brewster’s charismatic preaching and theologizing was an important factor in keeping the Pilgrims united during their time in Leyden. Bradford marvels that so many virtuous Pilgrims, not just William Brewster, lived to a remarkably old age—indeed, Brewster lived to be eighty years old. In spite of the fact that the Pilgrims live hard lives and sometimes want for food and shelter, their faith keeps them strong. Many Puritans did, indeed, live extraordinarily long lives in New England (although many of them died in childbirth, or of disease, too)—and as usual, Bradford credits their successes to their faithfulness and God’s approval. 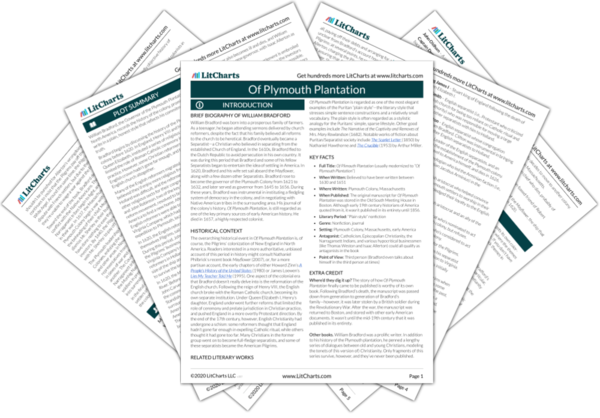 Get the entire Of Plymouth Plantation LitChart as a printable PDF. Bradford next describes how the Narragansett form an alliance against the English, alongside whom they’d fought in the Pequot War. In response, the leaders of Massachusetts, Connecticut, New Haven, and Plymouth form a close alliance. According to the alliance, these “United Colonies” would defend one another and share expenses in all future wars. The United Colonies alliance also requires the appointment of new leaders—commissioners and presidents—to serve on a council. The United Council was a major milestone in New England history because it marked one of the first times when the New England colonies worked together. Not coincidentally, the impetus for this alliance was militaristic: the colonies wanted to make sure that they could defend their property from Native Americans and colonists from other nations. As such, the alliance marked a point when the colonists celebrated their collective European and Christian identity, instead of emphasizing their religious differences (as they’d often done in the past). At the first meeting of the United Council, held in Boston, the Council considers the immanent conflict between the Narragansett and the Pequot. At the time, Chief Uncas of the nearby Monhig tribe is feuding with Chief Miantinomo of the Narragansett. The Council, many of whose members are friendly with Uncas, decides to tell Uncas that they’ll support him in his attacks on the Narragansett. Shortly afterwards, Uncas captures and executes Miantinomo. The chapter ends with the first test for the United Council: the conflict between the Narragansett and the Pequot tribes. Bradford contrasts the order and cooperation of the New England colonies with the perceived disorder of the Native American tribes. Arn, Jackson. "Of Plymouth Plantation Book 2, Chapter 23." LitCharts. LitCharts LLC, 21 Jun 2017. Web. 20 Apr 2019. Arn, Jackson. "Of Plymouth Plantation Book 2, Chapter 23." LitCharts LLC, June 21, 2017. Retrieved April 20, 2019. https://www.litcharts.com/lit/of-plymouth-plantation/book-2-chapter-23.